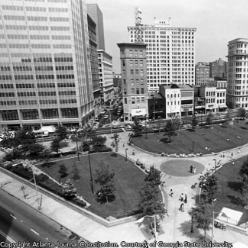 Dive into the rich history of Woodruff Park and the surrounding Downtown Atlanta district during this one-hour guided tour. From the Civil Rights movement to the birth and growth of the Coca-Cola Company, you'll hear about the buildings that once stood in and around the Park, about those who bought and sold the property that is now part of the park, and major historical events that happened nearby. Meet at the ATL Playground. Free with an online RSVP.